Spray 12-inch nonstick skillet with cooking spray; heat over medium-high heat. Cook chicken in skillet 3 to 5 minutes, stirring frequently, until light brown. Remove chicken from skillet. Cook rice and vermicelli mix (without seasonings) in skillet over medium heat, stirring frequently, until golden brown. Gradually stir in water, tomatoes and seasonings from rice and vermicelli mix. Heat to boiling. Stir in sausage and chicken; reduce heat. Cover and simmer 15 to 20 minutes, stirring occasionally, until liquid is absorbed and chicken is no longer pink in center. 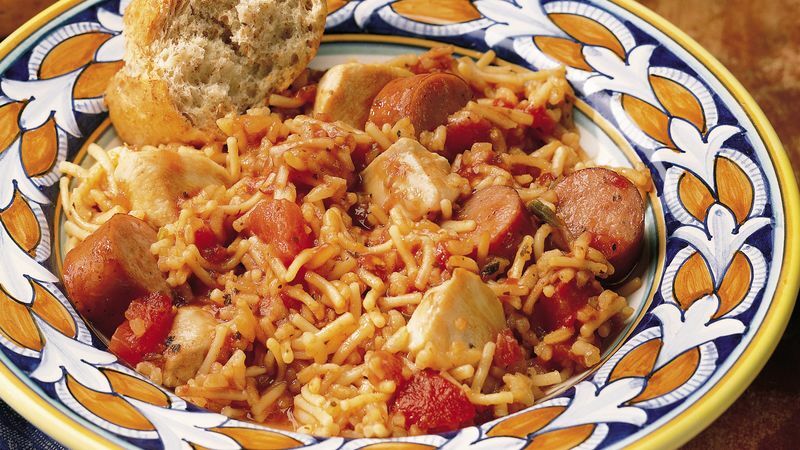 Jambalaya--a Creole classic--varies widely depending on the cook. Some say that this dish got its name from the French word for ham (jambon), which was the main ingredient in many of the first jambalayas. Can't find chunky tomatoes with crushed red pepper? Add 1/4 teaspoon or so of crushed red pepper to a 14 1/2-ounce can of regular chunky tomatoes instead.